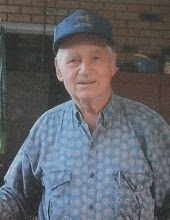 Harold Hayden Hodge, 94, of Marion died April 3, 2015, at his home near Frances. He served in the U.S. Army at the 64th General Hospital during World War II. He was a retired steel worker and a member of Emmaus Baptist Church. Hodge is survived by his wife, Alpha Ophelia Fuller Hodge of Marion; six sons, Mike (Vicki) Hodge of Florida, Paul (Jeannie) Hodge of Indiana, Mark (Christine) Hodge of Frances and Reg Hodge, Tim (Hope) Hodge and Greg (Carol) Hodge, all of Marion; four daughters, Alfreda (Wayne) Wheeler, Mildred Hodge and Henrietta Ellington, all of Marion, and Brenda (Tom) Farrow of Pennsylvania; a sister, Mildred Matthews of Missouri; a brother, Bruce Hodge of Hobart, Ind. ; 27 grandchildren; 38 great- grandchildren; and two great- great-grandchildren. He was preceded in death by his parents, Asel B. and Mary Edna Vinson Hodge; a daughter, Wanda Hodge; five brothers, Randal Hodge, Oscar Vinson Hodge, William Hodge, Wilbur Hodge and Rawels Hodge; and a sister, Josephine Corey. Funeral services with military rites were Tuesday in the chapel of Boyd Funeral Directors in Salem with Rev. Tim Burdon officiating. Burial was in Owen Cemetery. Source: The Crittenden Press, April 9, 2015. Used with permission.